Red Dragon Cartel is the band of guitarist Jake E. Lee and bassist Ronnie Mancuso, they found their singer in D.J. Smith and their skinsman is Jonas Fairley. 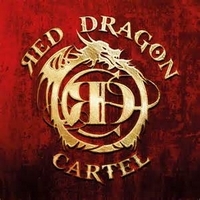 Guitar riffs lead you into Deceived, the album opener and it's no surprise that the guitar plays a prominent roll in the sound of Red Dragon Cartel. Singer D.J. Smith has a powerful, raspy voice and at this tune he reminds me a bit of David Lee Roth - with a dash of Ozzy at times. They present an up-tempo rocker with an 80's edge. With Shout It Out they add another flavor, this tune has an industrial edge. At Feeder they welcome a guest, Robin Zander of Cheap Trick is joining them! After Fall From The Sky they add some heaviness for Wasted where they got joined by Paul DiAnno. Half way through the album it got obvious that the songs vary, but all show Jake E. Lee's guitar play and they can be filed under melodic heavy metal. The album get even more interesting through the guests, so is In This Moment singer Maria Brink singing at Big Mouth, a heavy rocker. A bit Sabbath-ish sounds War Machine and again the vocals have an Ozzy-esque edge. After Redeem Me which features Sass Jorden this chapter is closed with Exquisite Tenderness, a short piano-based piece.